The BlackBerry Priv comes in a stylish two-piece rectangular box in the company's favorite black - talking business from the very start. Slide up the top and you are instantly greeted by the phone itself. Underneath the handset, there is another separate black box filled with some extra paperwork, which actually seemed way too spacious at first. It turned out to be ideal for stashing all accessories inside, so we can only assume that was its original purpose. The said accessories include a pair of headphones, not of incredibly high quality at first sight, and a 1A A/C adapter. Now, it is worth noting that the BlackBerry Priv supports Qualcomm Quick Charge 2.0, but the provided adaptor doesn't, so you have to get one separately, which really shouldn't be the case at this price point. Naturally, there is also a USB cable in the box. The Priv might not be the thinnest or most compact handset around, but it is far from bulky. Also, revisiting the slider form factor seems like something RIM obviously enjoyed. 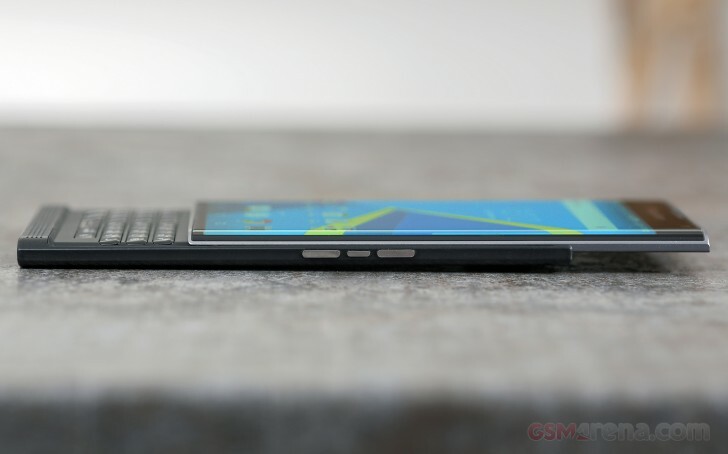 There is a lot to be said about the Priv on the topic of form factor and design. First things first, however, it is a BlackBerry device and it remain absolutely true to the company's aesthetic and core design, business-like and formal. You won't find anything hip or exciting in a youthful kind of way here. The Priv is like the black sedan of phones (ok, we promise that was the last car reference) and yet there are a few aspects and a few little things here and there that even the most serious executive types will surely find cheerfully refreshing coming from one of Blackberry's previous models. For one, the rounded corners of the screen really spice things up. It is the first such undertaking in the otherwise flat BlackBerry family and if nothing else it is definitely a bold and progressive move. Still, the curve is quite subtle - nothing too excessive or way overboard, but just enough to catch some curious gazes while lingering on the table at the board meeting. Another thing that definitely gives the Priv some character of its own is the slider form-factor and the physical keyboard that it reveals. Recent advances in the mobile realm have opened up a world of new possibilities, but still for all the good that big touchscreens have brought - style and originality are definitely not among them. And while this might not be a universal opinion, we definitely enjoy every such stab at reviving abandoned designs, like the clamshell or slider. Sadly, it is an indisputable fact - if you want an Android with a physical keyboard the BlackBerry Priv currently looks to be your only option, regardless of whether or not the keyboard is any good, but we'll get to that later. You could also opt for an after-market keyboard case solution, but that is bulky and not too convenient. Speaking of volume, however, the BlackBerry Priv definitely has a lot of it. It measures 147 x 77.2 x 9.4mm, when retracted, which isn't all that bad by today's standards, but sliding it out makes it virtually impossible to reach to top corners of the screen, no matter how long your thumbs can stretch. The phone weighs in at 192g, but it doesn't really feel bulky of heavy. Weight is nicely distributed and even when the slide is open, the Priv remains well balanced and allows a secure hold. The grippy back certainly helps. Speaking of materials however, sadly there is a lot more to be desired. Don't get us wrong, plastic works great and we have seen OEM's achieve incredible things with it, but we have just come to expect more at this price range and rightfully so, since the competition is more than happy to oblige. While the Priv feels sturdy enough and well put together for the most part, it is made of plastic all around. That's not necessarily as bad as it sounds if it were of higher than average quality. Sadly, that's not the case and the material used on the back is way too soft and really prone to scratching. It's also quite flexible and gives in a lot more than we would have liked when pressed. We also noticed some less than perfect hole cuttings on the front speaker grill, which is simply unacceptable with today's precision cutting equipment. While the slider works smoothly enough, it is far from sturdy and has some inherent wobble to it (although pretty miniscule) from the very beginning, which might spell trouble in the long run. Overall, BlackBerry could have done better with materials and crafting. Everything looks well enough, but upon closer inspection, it is not exactly flagship-grade. First thigs first - the slider. If we didn't already make it clear, we really enjoy this throwback to a forgotten time when this form factor flourished on the phone market. Despite the aforementioned minor concerns about the durability of the mechanism itself, we can safely say that BlackBerry has done an excellent job implementing the form factor and adopting it for a large-screen device. So getting to the keyboard is simple enough, but is it any good? Well yes and no. Build-quality is great, it looks nice with the subtle backlight illumination and individual keys are surprisingly comfy with a well-defined 3d texture, nice physical feedback and tolerable key travel. The only real problem with the keyboard is that it is just too small. It is definitely more crammed than most other BlackBerry devices and key travel is far from what fans will be used to as well. We do realize, however, that this is purely subjective aspect and your experience may vary greatly depending on the size of your thumbs. Plus, a few hours in using the Priv is bound to recover some of that old muscle memory and typing becomes a breeze. Rather surprisingly, we actually found ourselves using the keyboard as a means of keeping our fingers off the screen even when not typing on most occasions. It excels at that thanks to built-in capacitive touch functionality. Simply swipe your finger across the keys in any direction and you can easily scroll across most any interface and it works great. Furthermore, there is the added nifty ability to assign shortcuts to each and every separate key. So, you could pretty much have all of your routine actions hot linked in a way that allows you to completely keep your hands off the screen. Going round the rest of the device, we find the left side mostly empty. Only the power button resides here and it is quite conveniently positioned to be within reach both when the screen is open and closed. The same goes for the buttons on the right, only there are a few more in number. The volume controls are actually two separate buttons. There is also a third button in between. After a lot of poking around the only functionality we found it good for is to make it pull down the notification list or mute the microphone during a call, not much else, so it is definitely a little underutilized and more of a remnant of a former control scheme. The bottom of the Priv houses its micro USB port, as well as the 3.5mm jack. The latter is pushed aside as far as possible, which is greatly appreciated when trying to close a pocket zipper, while leaving the headphones connected. Blackberry has opted to move the physical card trays to the top of the device, which, frankly, makes a lot of sense. The Priv has a total of two - one for the nano SIM card and another for micro SD storage. Looking at the phone from this angle you can clearly see where the front and back half of the display slider meet. The front half has a different color and that provides a nice contrast. And finally, we get to the back. We already mentioned the overly soft finish, which you do need to be careful with. The 18MP camera lens is actually surprisingly compact. The camera bump is small and the camera glass is nicely protected by a thick rim. So no accidental scratches should occur. The only other thing on the back is the silver-plated BlackBerry logo. Refrain from pushing it too hard, if you can, as it does give in quite a bit.